During our stay in Somerset two weeks ago we also visited sites in neighbouring Dorset and Wiltshire. One of those sites was Stonehenge in Wiltshire, one of the most well known monuments in the world. We’ve passed by ‘the stones’ a few times as we’ve driven along the A303 and glimpsed them from a distance, but being close up to them is quite something else. The picture above is one from inside the Visitor Centre, showing Stonehenge as it is today. Stonehenge is located in the county of Wiltshire, two miles west of the town of Amesbury and eight miles north of the city of Salisbury. The monument and its surroundings became a UNESCO world Heritage site in 1986. It is a Scheduled Ancient Monument, is owned by the Crown and managed by English Heritage. The surrounding land is owned by the National Trust. But Stonehenge isn’t the only ancient site in the area. This stone circle itself is part of a group of late Neolithic and Bronze Age sites, including the timber monuments of Durrington, the small henge at Amesbury and the timber circle at Woodhenge. There are also several hundred barrows (burial mounds) in the area. In addition, 25 miles north of Stonehenge is the Avebury complex – argued to be the most impressive of all remaining prehistoric earthworks in Europe. The first thing we see as we pull into the car park is the new Visitor Centre, opened in December 2013. There is lots of illustrated information about the three main phases of construction of Stonehenge (as in the models below) as well as reconstructions and artists impressions of other nearby ancient sites. The first model above (left) shows the first major construction on the site, 5000 years ago, during the late Neolithic/New Stone Age. It was a circular enclosure with a ring of fifty-six pits which probably held upright pillars. Whether the pillars were wood or stone isn’t certain but it is likely there were some wooden ones in the enclosure. The chalk and earth from the enclosing ditch was used to make a large inner and smaller outer bank. Five hundred years after the enclosure was built (middle picture) enormous sarsen stones were raised in the shape of an inner horseshoe and a surrounding circle, with smaller bluestones between them. The stones were aligned on the midsummer sunrise and midwinter sunset. 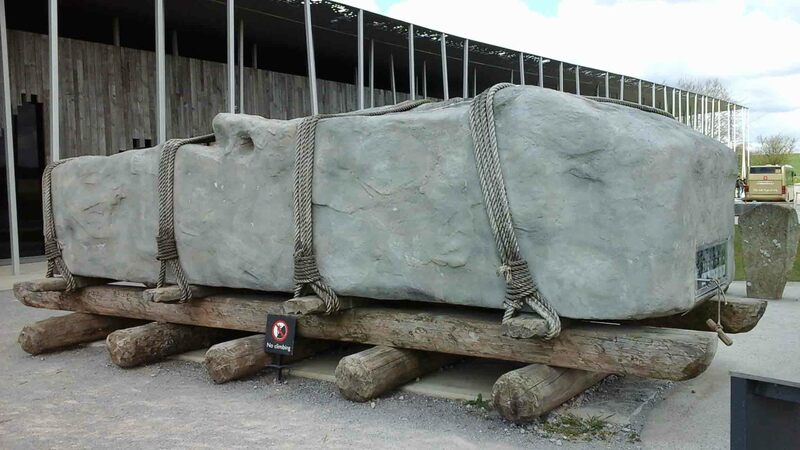 The huge sarsens were brought from 20 miles away, in north Wiltshire and the bluestones from several sites in Wales – some 140 miles away! Construction and alteration stretched over a period of 800 years, into the Bronze Age, by which time Stonehenge had become the greatest temple in Britain. Many stones would have fallen naturally, others removed from the site for building material by local people. Visitors carved their names on stones and chipped off pieces as souvenirs. In 1908 a stone of the sarsen circle fell, leading to the first restoration project when the tallest stone, leaning dangerously, was set upright. Work continued and between 1959 – 64, all the stones that had fallen since 1740 had been re-erected and many others set in concrete. Hut with interestingly styled roof. Showing tenon on top of a standing stone. This would have fitted into the mortise of the capping lintel. The reasons for WHY Stonehenge was built has been the most difficult one for archaeologists to answer, but it’s generally accepted that the monument was built as a temple: a place of ceremony, burial and celebration. Stonehenge has an axis that runs north-east to south-west, and was chosen because it reflects events in the annual movements of the sun and moon. The entrance faces the rising sun on the day of the summer solstice. The Avenue is also aligned with the winter solstice sunset. 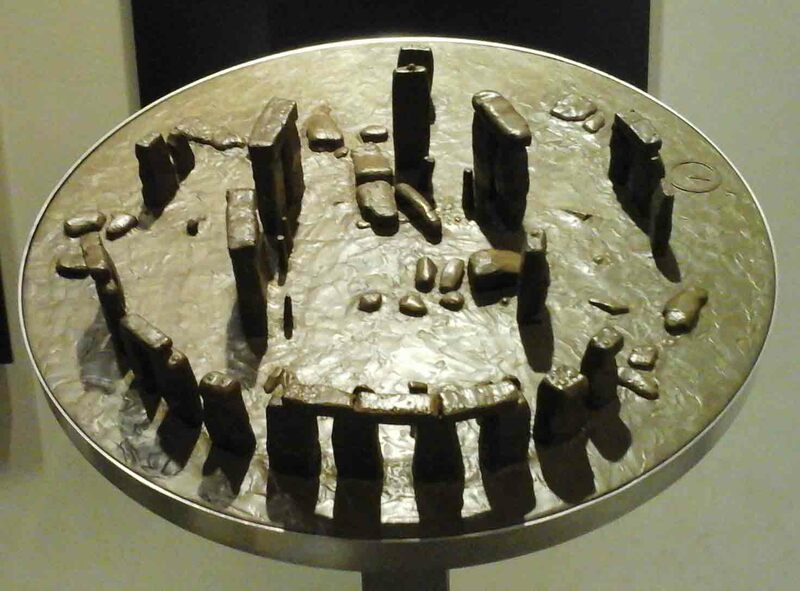 That Stonehenge served as a solar calendar and marked the changing seasons is a plausible hypothesis. People of that time were dependent on the weather for the success of their crops and animals. During the cold, dark winter days they would long for the sun to return with his light and warmth – and at the winter solstice, they celebrated the fact that the sun would be doing just that. The number of pig bones found on the site have been offered as evidence of mid-winter feasts here, to celebrate this turning point. Stonehenge as a place of burial is supported by the hundreds of human bones found at the site which show signs of cremation before burial. And of course, it has often been thought that Stonehenge was a place of sacrifice, notably human. One fallen sarsen stone in the main entrance to the Stonehenge enclosure has become known as the ‘Slaughter Stone’. This is because of the shallow indentations that fill with rainwater which reacts with iron in the stone and turns a rusty red. 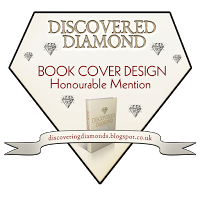 The guide book attributes the given name to the ‘over active Victorian imagination’. Another idea put forward is that the bluestones were transported all the way from Wales because people there told of their healing powers. 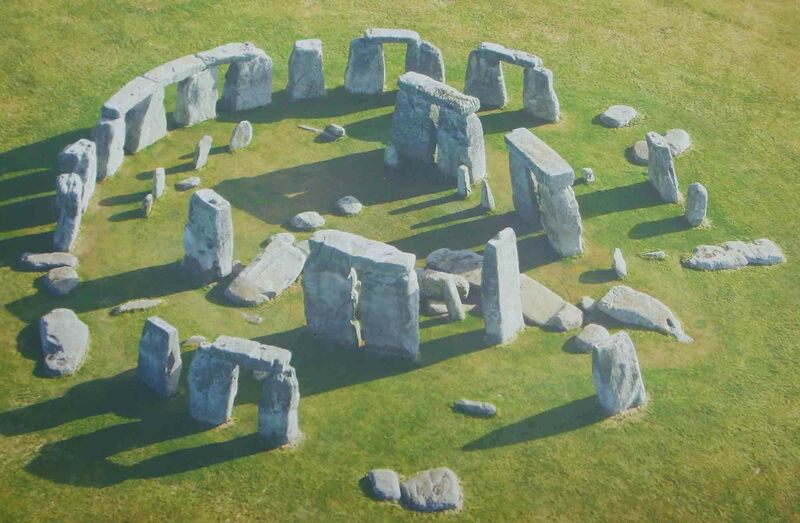 So all in all, theories as to the purpose of Stonehenge are still being bandied about. One source suggests that Stonehenge can (perhaps) be seen as the prehistoric equivalent of a great cathedral, such as nearby Salisbury – built for worshipping, but also as a place where people could find healing and hope and important people could be buried. Previous The Surrender of Newark! Wonderful post! Visiting Stonehenge is on my bucket list. Thanks for allowing me this visit vicariously. Thank you, Tammi. Famous as it is – and close as it is for me – this was my first visit to Stonehenge, too. It’s certainly worth a visit, particularly nowadays. The site has been so well ‘updated’ to accommodate the many visitors with enquiring minds and the visitor centre tells the Stonehenge story very well. Thank you for reading – and I hope you make it to the site one day. This is fabulous Millie, another place I would love to visit some day….I’ve always liked the notion that no one seems to know for certain what it was built for but I think your explanation is a good one. It’s such a well known place, isn’t it? We’re kicking ourselves for not having visited earlier. But it’s a great place to spend a few hours, especially on a nice day. Its purpose has always been debated and, thanks to the Victorians, for years many people were convinced that human sacrifice was the main thing that went on there. That hasn’t completely been ruled out, but there are so many other theories now. And no doubt ideas will continue to change over the years. Perhaps next time you and your son are over here, you’ll find time to hop to Stonehenge and have a look. Thanks, Michael. It’s certainly on my list Millie. This brings back memories. I visited Stonehenge 20 years ago on a trip to England with my niece’s high school. I was so entirely impressed with it, but for some reason, we had only 20 minutes to both view the monuments and have lunch. Then we got back on the bus and went to Salisbury where we spent 3 HOURS wandering around the cathedral. I really felt the trip’s planners had their priorities wrong, and hope one day to get back to Stonehenge again. I haven’t been there for over 30 years! I’m pretty sure we could wander among the stones back in those days :-). It sounds worth another visit though – back then there was only a car park and the stones. Shame it’s so far away! Yes, the stones were open to anyone for many years. But, like all other ‘special’ places, people took advantages and caused damage – even little things like chipping off bits of the stones to take home. Now they ‘open up’ the circle a few times every year, but I believe you need to book in advance. Thirty years is a long time, and the site would probably look very different to you now. It is a long way from where you are, and you’d probably be best to stay in Salisbury overnight, or somewhere else close by, to cut down on the driving. We had 60 miles each way from Chard in Somerset and you’re much further away than that. Thanks Cameron. It was when we lived in Wantage that we drove past Stonehenge, too. I don’t know why we never thought to go and have a look then. It’s worth a visit, especially if you want to find out more about it. There’s a lot of info in the visitor centre and on boards around the site. I know what you are saying. I have never been and yet I live so close to it….! So amazing! Stonehenge is definitely on my bucket list too. I know the stones are big, but every time I see a person standing beside one, it always strikes me: boy, they are BIG. Although you know me, my favorite parts are the theories about how the site was used, and of course, the reconstructed huts. I look forward to visiting some day soon. Thanks Chioma. It was my first visit and I’m really glad we went. I learned a lot! Beautiful! Wonderful message about stones in your words. Thanks for all the likes and comments. Great post and pictures! I love the history and all of the pictures you put up! Very interesting! Stonehenge is quite an awe-inspiring place. It has a very mystical feel to it, probably because it’s so very old. Thanks for visiting, Lynn. Interesting post. I did go there in the 80’s to see the sunrise on the longest day a couple of times which was a truly memorizing event. Never realised it was a burial site. Wow, this is such a late comment. Sorry Andy. I wish we’d visited back when we lived in Wantage for 6 years. I’d love to see the sunrise there at Midsummer. They do take bookings for such events, but we’d have to have another holiday down there to do that – and we have a long list of places on our ‘to visit’ list. Still, we got to see the place, at least. Great pics. 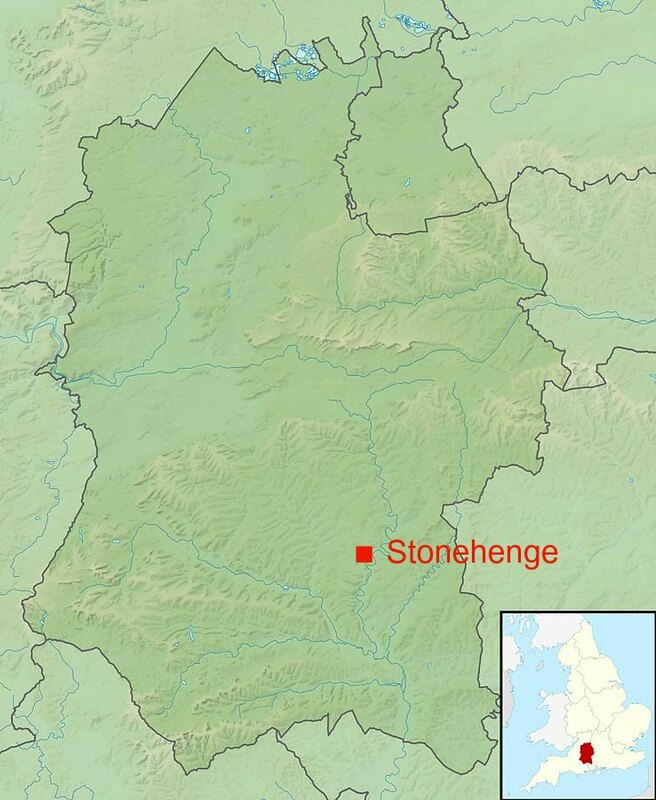 I’ve been in the area, but have yet to visit Stonehenge. Next time I hope. Thanks. Thanks Peggy. We’d been in the area many times and never visited Stonehenge. In fact we lived not far away from the site for 6 years. It’s well worth a visit, although many people say it isn’t as impressive as nearby Avebury – which I’ve never visited, either. Next year, perhaps for that one. Thanks for the update of Stonehenge, one of the most special places that I’ve ever visited. I was there over 30 years ago, before the visitors center and before the ropes that kept people from being close up. I took a photo that I framed and hung in my bedroom all these years. When I walked into that circle, I felt a big – what? – I don’t know what it was, besides some kind of immense energy that vibrated within me. I didn’t want to leave. My guess is that intense worshipping/celebration/prayer for love and after loss, occurred there. My guess is that humans were much more attached to the earth, sea, sky, and themselves than we all are now. Thank you for visiting my post! Yes, a lot has changed with so many historical sites nowadays. Everywhere has visitor centres, cafes and gift shops. But I must admit, there’s lots of information available, too, which there never used to be in the past. You were lucky to have been right into the circle -that’s something I’d still like to do at some time. As you say, Stonehenge is an awesome site, and what you say about the way you felt there makes a lot of sense. I know the feeling. Hope you’re having a great time over in the US! It’s always lovely to be with family. You won’t want to come home (if you aren’t already back). Oh I am already back! Don’t know where the time went. I visited Stonehenge in the early 70-s, before the fencing. Not many people were there the day I was and it was quite inspiring to walk around and touch the great stones. I returned recently and saw the changes and was not able to touch the stones that day. Thank you for the information on the village and on the history of this historical site. And it was quiet and very magical. I wish there’d been digital photography at the time, because now I can’t find the photos of my first trip to the British Isles. And yes, I’d heard that graffiti was becoming a problem. Such a shame! We’ve lost so many of our old photos, especially of wonderful place we’ve visited abroad. Some were the old-fashioned, printed photos, but some were stored on our old computer, which crashed. Being novices in the use of computers at the time, the photos weren’t stored anywhere else. Many were from countries in North Africa that we aren’t likely to visit again, given the present political situation out there. That is a shame! I love taking photos and like you, they do bring back wonderful memories for me. I have to start removing some of the photos in my blog media file, but hesitate to do that because I could mess up my posts. I know the problems you encountered a while back. Great post, Millie. 🙂 I’ve always wanted to visit Stonehenge someday. What intrigues me is its purpose, which still remains unclear.